We had two temperate November days this week. Taking advantage of temperatures in the 60’s yesterday we prepared all three hives for wintertime. We checked the yellow jacket traps; emptying and replacing the soda inside as necessary. All three honey bee hives were a flurry of activity, especially hive No. 3 which had a cloud of bees out front by time we were done. Thankfully hive No. 1 had a lot of bees coming and going from its entrance. 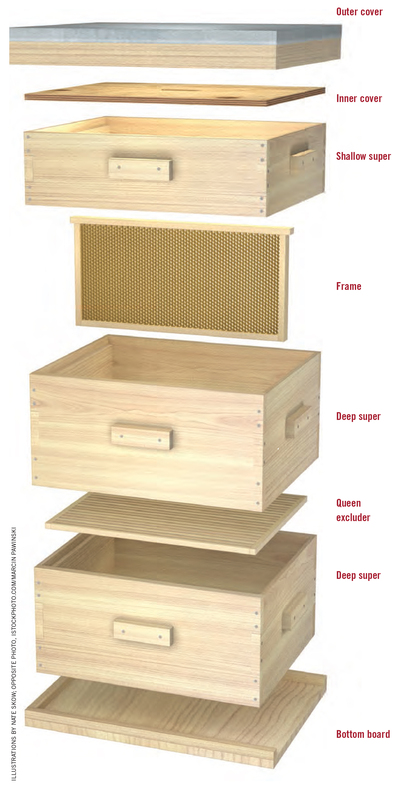 Locate as much honey towards the center of the upper deep box (second box from the bottom). I actually did this the last time I checked the hives a few weeks ago. Installed a new form of insulation on all three hives. You may recall last year I made a shroud out of rigid insulation for the hive, which worked well but was labor intensive. It also fell apart when I took it off, so assembling it may have been a challenge. This year we got pre-made insulation “blankets” that wrap around the hive. They’re basically heavy-duty black plastic, garbage bag like material, with insulation inside. I slid one over each hive. The hives are set up in this order: deep, deep, medium super, top board. I stapled the insulating blanket just below the top board (inner cover), which leaves enough space for the bees to enter and exit in the front, down low. Take a look at the photos below for a better idea of what’s going on. I used staples, but push pins would work too (I just didn’t have any handy). The insulation should be reusable year to year. It’s a new product so we’ll test it out and see how it goes. On top of each inner cover we placed nearly a full bag of sugar. The sugar will absorb moisture in the hive all winter and crystallize. Theoretically it will provide a source of nourishment as well, though I’m not sure if that’s right. The wife got this tip from a fellow apiarist at the grocery store of all places. We’ll see. I’m not sure what harm it could cause, so why not. I placed two plastic shims on top of the inner cover and then installed the outer (telescoping?) cover. This gives the roof of each hive a little angle to shed water. You may not recall but I inserted a strip of 1/2″ wood along the one side of each outer cover to make them “air tight” when the wasps were attacking. Normally the cover has some play left to right which allows insects (and mice!) to get into the hive up top. By leaving that strip in it’ll make a tight seal up top and hopefully allow the hive to retain more heat during the winter as well as keep pests out. Lastly, I will put some rigid insulation on top of the outer cover to keep heat from escaping. I use the pink stuff I have left over from last year’s insulating shroud. illustrations by nate skow via http://keepingbackyardbees.com/build-beehive/ We don’t use a queen excluder, but everything else if pretty much how our hive is set up for winter. The bottom deep is virtually empty in some of the hives. All the action happens in the upper deep. So everything is looking good on the bee front. Hive No. 1 is doing well, just have to see if they have enough honey. Hive No. 2 has plenty of honey hopefully, if there’s any left over then we will harvest that in the spring. Hive No. 3 should be have enough honey, but I doubt enough that we’d harvest next year. There’s nothing else to do bee-wise now ’til spring. Stay tuned for some posts on an indoor project I’m working on right now. Until then, keep warm. All three hive winterized, sans the insulated tops I need to fabricate. Hive No. 1 is on the left, No. 3 on the far right. Insulating blanket installed. Stapled just below the inner cover. Sugar on top of the inner cover to absorb winter moisture in the have. It should crystalize and provide an emergency reserve for the bees. The black strips are composite shims that will give a little angle to the outer cover, encouraging water to run off the top of the hive.